Frugal Mom and Wife: Diamond Candles Flash Giveaway! (5/30* - 6/1) WINNERS ANNOUNCED! Diamond Candles Flash Giveaway! (5/30* - 6/1) WINNERS ANNOUNCED! Diamond Candles Flash Giveaway! Frugal Mom and Wife has teamed up with afew AWESOME Bloggers to offer you TWO Diamond Candles! Just a FEW entries to fill out and you will know if you WIN in just 1 day! How AWESOME is that?! Good luck!Don't know what Diamond Candles are? made right here in the USA in Durhan, North Carolina! 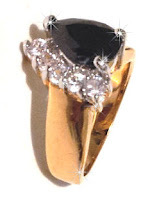 (wrapped in a foil paper or foil pouch) valued from $10 to $5,000! 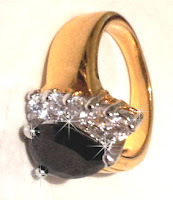 This is an example ring that could be found in your Diamond Candle. Looks like it's worth $10 and it's cute, but it could be worth $5,000! to like their pages on Facebook. All other entries are optional. You can complete 1 entry or ALL of them. The more entries you complete the better chance of winning. But you MUST complete at least 1 entry to be in with a chance of winning. Contest is open to USA & International with Free Shipping. cash prize in the same amount. and will have 24 hours to reply back before a new winner is selected. Giveaway ends Friday June 1, 2012 at 11:59 PM EST. Good luck! love diamond candles i have bout 4 total! Chocolate Truffle sounds like a wonderful scent!! I have yet to try one but Apple sounds yummy! The Vanilla or the Strawberry would def be my choice! Vanilla scents are my favorite. I haven't had the joy of smelling one yet, but I think that I would really like the strawberry! I haven't ever smelled these, but I knew right away that my favorite would be Apple Slice! I love any candles but lavendars are always my favorite scents. I have never had a chance to smell this brand but I know I love fruit scents! I would have to say coconut. It makes me feel like I'm somewhere tropical! I Love Candles..would love to try the Diamond Candle never seen or know of them until seen on facebook..any scent in a candle..Love Candles!